I wore this dress to a wedding on Saturday; loyal readers of my blog may recognise it as the Review Audrina dress that I posted on a wishlist a few months ago. I never actually thought I’d buy it but, when it was substantially discounted, I couldn’t resist. I was a little worried about another guest turning up in the same dress, since it does come in four different colours and was on sale, but fortunately I was safe. It was interesting to attend a wedding only five weeks after my own. Now I know what it’s like to be on both sides; it felt so different yesterday getting ready so quickly and then driving to the venue only a short time before it started, in contrast to a whole weekend away and the huge amount of preparation that went into my own wedding. Yesterdays wedding was extremely different in style; the warm weather and scenic views of the harbour made it very lovely. Also since I haven’t actually been to very many weddings, it was great to have the opportunity to choose an outfit to wear to this sort of event. I really love the unique shade of blue and of course the lace. I also managed to make good use of my wedding accessories. I wore my wedding shoes; unfortunately it is difficult to see the detailing in the photos, and one of the bridesmaid’s belts. 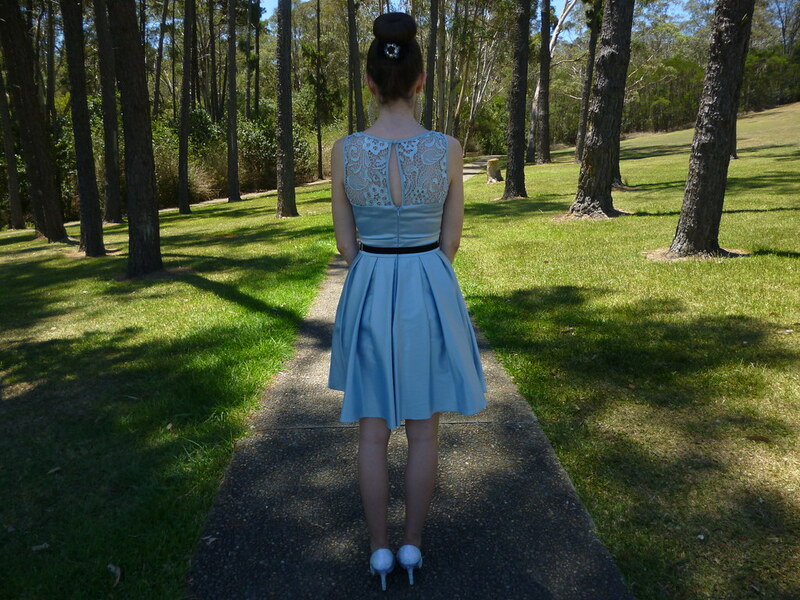 I thought the sparkly shoes would go well with the light blue. 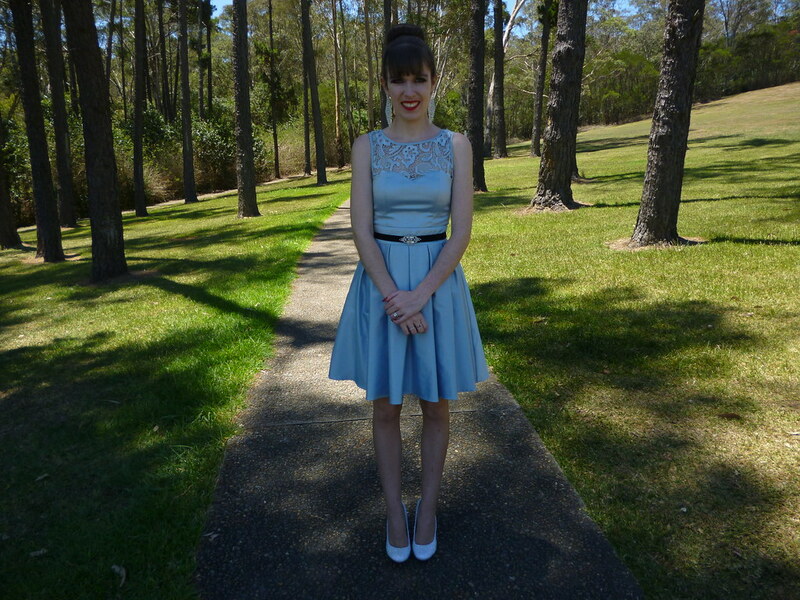 This entry was posted in Alannah Hill, Outfits, Review Australia. Bookmark the permalink. should we follow eacht other? Oh my gosh, this is seriously such a beautiful outfit! You really look amazing,oh goodness. That dress color and those heels remind me of Cinderella. You're totally a princes here! Those heels are just the dreamiest heels in the world (and even more lovely that you were married in such stunning shoes!). Dear, you're like a princess! So adorable! Hi sweety, absolutely gorgeous look, you look so beautiful! That dress is so gorgeous! Glad that you were able to purchase it! Pretty! I love all the fancy floral detailed lace above the bust-line of your Review Audrina dress. 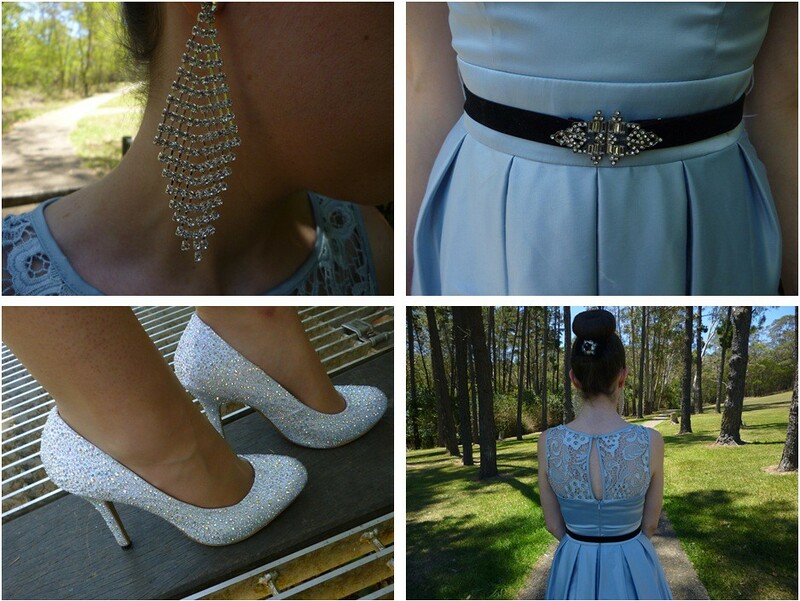 I agree, your earrings, belt clasp and sparkly shoes pair up beautifully with the light blue of your dress. Oooh, how beautiful! And your shoes are amazing! If I could buy a pair of small-heel version of these for my wedding, I'd be happy! They're lovely! That dress is so stunning! I haven't been to a wedding in ages. I love this outfit. The dress is absolutely stunning! You look great. This is a STUNNING dress, you look truly beautiful. It's always nice to get an opportunity to dress up for stuff like this! 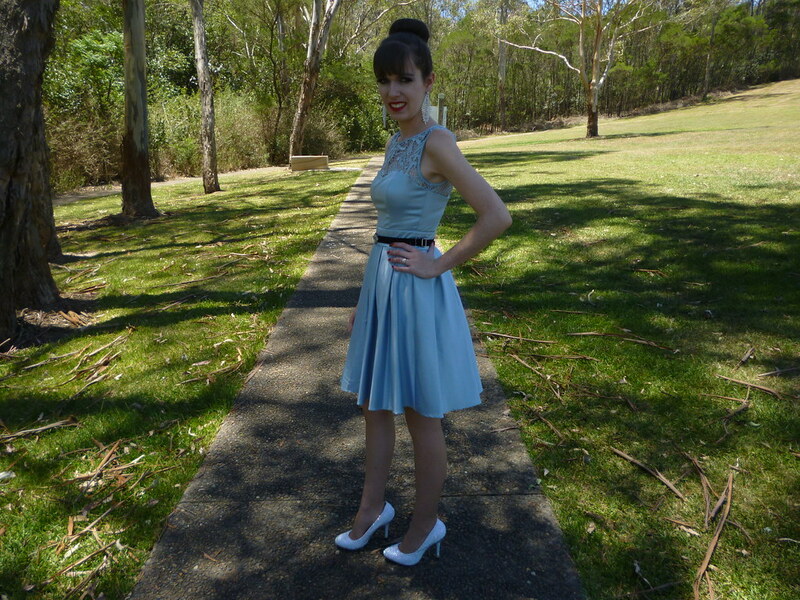 So pretty, love the icy blue and heels. you look stunning! 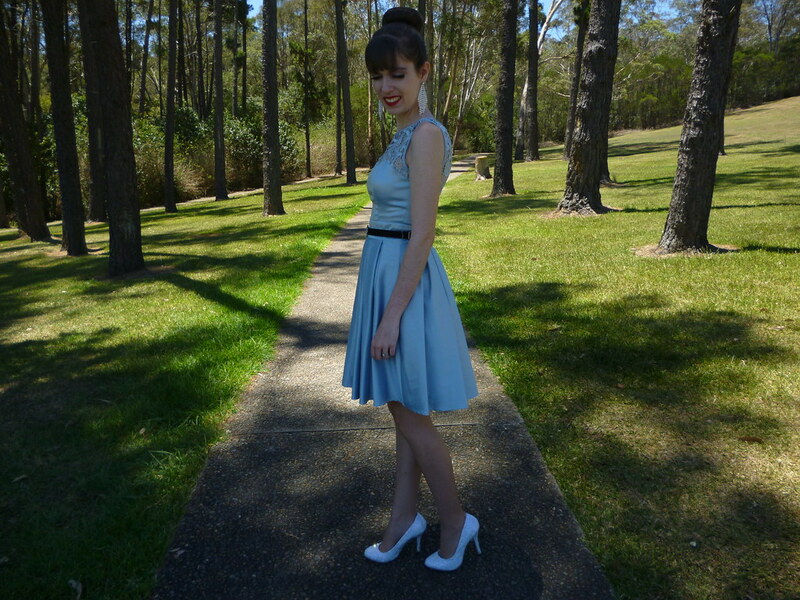 i can see why you wanted this gorgeous dress…and it looks like it was made for you! you are a throwback to old hollywood! i love your dress and it's really good to hear when the items we wanted, we buy ! You look perfect! I adore that dress and it goes perfectly with your shoes and belt! Imogen you look positively stunning. I always love your outfits because there's a real sense of imagination in them. Also did you get the second letter I sent at all? I'm hoping that this one did arrive! The shoes are lovely too, they go so well with the belt and your earrings. Okay, you are adorable! This dress is fabulous! That is such a sweet dress! You look beyond beautiful! Lovely! Wow, such a breathtakingly pretty sweet dress. Totally your style. Gorgeous dress! The cut and color are perfect. And your shoes are amazing! Thanks for stopping by! It's very awesome getting dresses for someone else's wedding. And this dress is the perfect choice. You look great in it and those earrings! wahoo darling you look stunning! Hope the new year is special for you with your new husband…off now to check out some more wedding pics! You look stunning, so ladylike and elegant. I like that you got to wear your wedding shoes again, they are fab, I hope you get to wear them many more times as they deserve to be worn. this is such a romantic dress, and your heels are PERFECT!!!! So pretty! That blue really suits you and this is a perfect wedding look. I love the detail on the top of that dress! I love the lace detail on your dress and of course the sparkly shoes. This is a STUNNING, dress! I love the pale periwinkle lace. It's so classic, and stunning. Beautiful dress. I want one of my own! This dress is so pretty and flattering! I absolutely love this color on you. Your gorgeous wedding shoes definitely look perfect with it too.